This week, the only thing I seem to have thought about, talked about and read about is sleep. More specifically, babies and sleep. On Monday we went to our weekly class/group at the children’s centre, My Baby and Me. 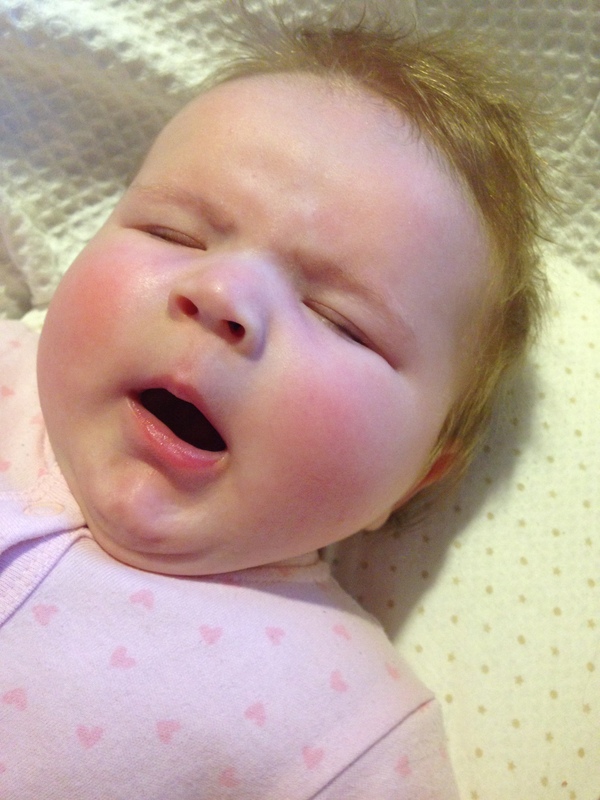 Each week, they focus on something different, eg Feeding, safety, brain development and this week… You guessed it – sleep. I chatted with the lady who gave the talk about my difficulty in putting Lottie down for a nap. She just hates it. She would sleep in your arms for as long as you let her, but the minute you put her in a Moses basket, cot or pram, she wakes up and cries. Don’t get me wrong, I love a cuddle as much as she does, but she does sleep rather a lot and I cannot get anything done around the house as I am constantly underneath a sleeping baby. At the moment, she does go down in her cot at night after her bedtime routine, so I don’t feel I can complain too much as we are really lucky on the whole with her night-time sleep. We’ve also been a little bit worried that as she gets older and more aware, she may realise this day/night difference and decide she would rather have a cuddle to sleep at night too, so we needed to nip it in the bud, so to speak. So I’ve been following a few suggestions this week, but putting her down when she is sleepy but not asleep and sitting with her, stroking her face etc so that she knows I am there, but not picking her up if she whinges a bit. I’m not a fan of crying it out. I don’t have any problem with anyone else doing it, as I know it works for many people, but it’s not right for our family. Anyway, we have had some success in the Moses basket for naps this week already without having to leave her to cry. Every time she drops off, I feel like we’ve made a huge achievement (and invariably take a photo as evidence). Then I feel a little bit sad and lost because I can’t have a cuddle – there really is no pleasing me sometimes! The victory during the day however, was followed by some awful nights. From 11pm-ish, Lottie has been waking up pretty much every hour. Coupled with a very poorly horse meaning that I have been getting up even earlier than normal to care for him before Mr M goes to work, I’ve only been getting around 4-5 hours sleep each night. A friend who’s bay is a few months older than Lottie reliably informs me that this could be the four-month sleep regression arriving a few weeks early. And for her it lasted three weeks… Roll on Christmas! How do you manage sleep deprivation?